Teamsters of Prince Edward Island will introduce you to beautiful Prince Edward Island as you meet four very interesting teamsters. Blair Shaw takes us on a wagon ride with his Percheron team as he explains his family’s history of working with draft horses. He shares photographs of his Dad and Grandfather. Blair explains and demonstrates his homemade log loader. Jack Gromley shares his love of raising registered Clydesdale horses and why he came back to Prince Edward Island after he retired from the military. We meet up with Roger MacLeod and his daughter Sarah on scenic Panmure Island. Roger and Sarah share a special bond as they take us on a unique wagon ride with their Belgian team along Â the beach, seeing the traditional lighthouse in the background. Roger gives us a tour of Panmure Head Lighthouse which is a popular tourist attraction. 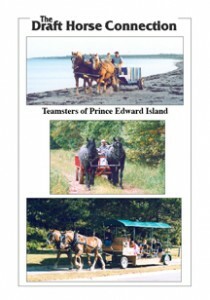 Finally we end up in historical Charlottetown where we find Sarah Greenan who operates Emerald Isle Carriage Tours. We find Â Sarah with her two teams of Belgians hooked to trollies and a single Percheron horse hooked on a carriage waiting for cruise ship clients who have booked horse drawn rides. We travel along with Sarah capturing the history of this beautiful city as Sarah narrates and shares the rich culture and what inspired Sarah to move from western Canada to independently start up this successful business.